A Supreme Court bench in the case of Lok Praharivs State of Uttar Pradesh, held that former Chief Ministers are not entitled to Government Accommodation. The Bench has also directed that any such possession of Government accommodation should be vacated within 2 months. With the above order, former UP Chief Ministers including Rajnath Singh, ND Tiwari, Mayawati, MS Yadav, Ram Naresh Yadav and Kalyan Singh will have to vacate the Government accommodation within two months. Bench comprising of Justices V. Gopala Gowda and Adarsh Kumar Goelquashed criminal proceedings against a Girl who was booked for attempting Suicide observing that ‘no purpose will be served in prosecuting the Girl’. Supreme Court of India on Friday issued important directions to prevent the menace of growing adulteration and sales of adulterated and synthetic milk in different parts of the country. The Bench issued the directions in a Public Interest Litigation filed by SwmaiAchyutanandTirth and Others. The petitioners allege that the concerned State Governments and Union of India have failed to take effective measures for combating the adulteration of milk with hazardous substance like urea, detergent, refined oil, caustic soda, etc. which adversely affects the consumers’ health and seek appropriate direction. In a relief to Electrotherm (India) Ltd., the Supreme Court modified the order of Gujarat High Court which had required it to shut down its Steel and pipe manufacturing plant in Bhachau block of Kutch district in Gujarat. The Apex Court, disposing of the appeal by the Company, permitting it to function, also directed the authorities to conduct ‘post decisional’ public hearing in this case. The Supreme Court of India in Madina Begum & Anr. Vs. Shiv Murti Prasad Pandey observed that it is unfortunate that the Parties have to undergo another round of litigation because of non-consideration of settled legal principles by High Court. The apex Court has reiterated that, in the absence of a specified date for the performance of the agreement, the limitation period of three years, prescribed in Article 54 of the Limitation Act, for filing Suit for Specific Performance of Contract would begin when the plaintiff has notice that the defendant has refused the performance of the agreement. In an anti-climax after lengthy hearings, the Supreme Court on Wednesday said it will not answer any of the questions raised by expelled Samajwadi Party leaders in a plea filed by them to re-examine the anti-defection law, which lays down rules for disqualification of MPs or state assemblies for crossing the floor during voting on any particular issue. Supreme Court of India directed the Odisha Government to pay additional Compensation to the victims of 2008 Communal Violence in Kandhamal District of Orissa. A three-judge bench of the Supreme Court on Tuesday, dismissed a challenge to extension of tenure to a civil servant in 2010 for five years. The challenge was on the ground that the civil servant did not get the mandatory clearance from the Central Vigilance Commission (CVC), before the Government granted her extension of tenure for five years. The Apex Court on Monday upheld the clean chit given by the subordinate courts to BJP President Amit Shah in the Sohrabuddin Sheikh fake encounter case and rejected the plea for reviving the case. Supreme Court on Friday refused to hear a suit filed by Delhi’s Kejriwal government – under Article 131 of the Constitution – seeking a judicial declaration on the boundaries of the constitutional relationship between the Delhi government and the Centre, in administering the national Capital especially to clearly earmark each of their powers. The Supreme Court on Monday issued notice to the Health and Family Welfare ministry on a PIL which sought immediate steps to combat the drug menace in the country. 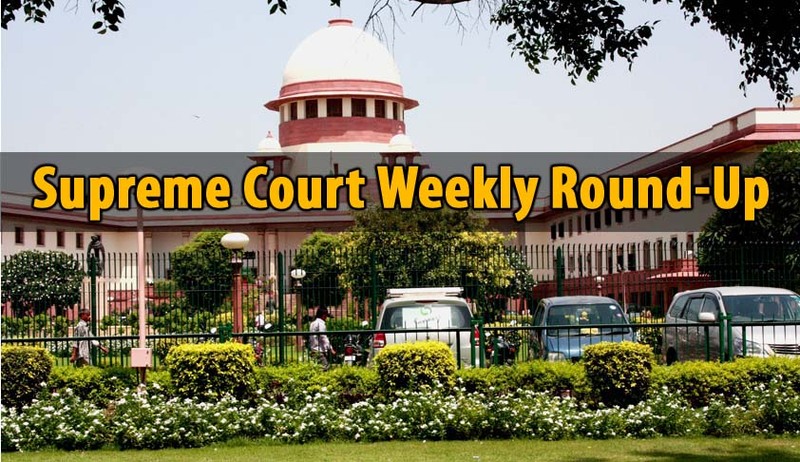 A bench headed by Chief Justice T S Thakur also asked the Centre to spell out the action taken by it for implementation of the recent direction on ensuring safe custody of narcotics and psychotropic substances seized by the enforcement agencies.